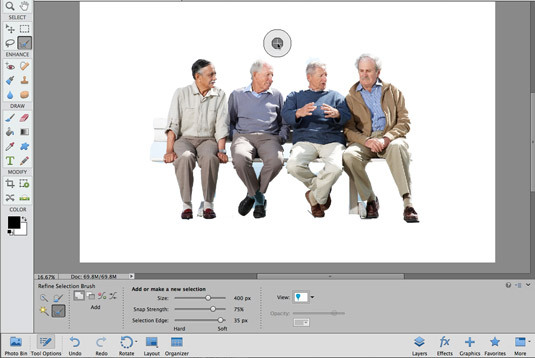 Being able to make selections quickly and accurately in Photoshop Elements is a coveted skill. Luckily, Elements has an additional tool to make this skill easier to obtain. The Refine Selection Brush helps you to add or delete portions of your selection by automatically detecting edges of your desired element. Make your selection using the Quick Selection tool, Selection Brush, or any other selection tool, for that matter. Elements doesn’t care how you make your initial selection, as long as you have one. Don’t worry if it isn’t perfect. That’s where the Refine Selection Brush comes in. Select the Refine Selection Brush. This tool shares a tool slot with the Quick Selection tool, Magic Wand, and Selection Brush. Your cursor appears as two concentric circles. The outer circle reflects the Tolerance setting to detect an edge. Specify the settings in the Tool Options. Size: Use the slider to adjust your brush diameter from 1 to 2,500 pixels. Snap Strength: Use the slider to adjust your snap strength from 0 to 100%. Snap Strength indicates the intensity of the pull. Selection Edge: Use the slider to determine how hard or soft your want your edge. If you have an object that has wispier edges, such as hair, fur or feathers, moving the slider more toward soft may be more effective in getting your desired selection. If you set your mode to Add and press and hold your cursor on your object, the selection within your concentric circles grows. Specifically, the lighter colored area around your center circle, called the selection edge, grows. This represents your object’s edge. Be sure to include your entire edge within this area. Note that you can also “paint” the edge with the Refine Selection Brush tool. Getting the selection you want on a complex object may take a bit of experimentation and refining using the options, but hang in there and you should get the detail you want. Add/Subtract: Choose this mode to either add to or subtract from your selection. Smooth: If your selection border looks a little too jagged, use this mode to smooth your selection edge. View: Choose an option to view the selection. Options include viewing your selected object against a white or black background. Or you can choose Overlay to view it against a red semi-opaque overlay. Note that with the Overlay option, you can adjust the corresponding opacity of that overlay. Continue to use the Refine Selection Brush to perfect your selection until you’re satisfied. Use the new Refine Selection Brush to fine-tune your selection.